We open our eyes. We reach. We scratch. We claw for our phones. We unlock, tap, scroll. We compliment; we cheat; we flirt endlessly with social media, instead of looking at someone’s face or looking into someone’s eyes. We're replacing lips for keyboards and heartbeats for message tones. 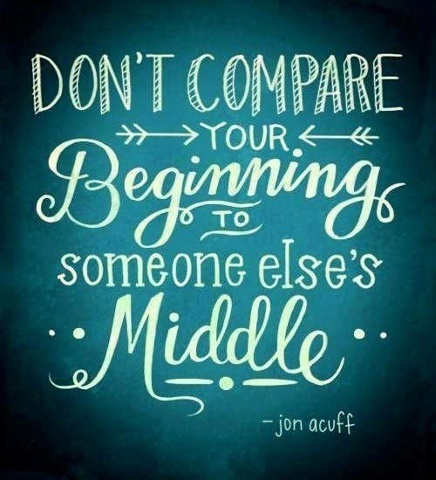 I read a quote the other day that read, “Don’t compare your beginning to someone else’s middle.” I think it’s brilliant. In eight words, some clever chap has wrapped up all that is wrong with our Millennial lives and thrown these words like confetti over our heads. We are suspended in a constant state of comparison. Bodies, wealth, career, relationships -- as soon as our eyes open we are entering into the same cycle. I’ll admit it: I get restless. Like everyone else, I have a big list of things to do in my mind, and I want them all done at once and out of the way, and all the time, it never, ever works. We want immediacy -- an instant message, an instant comment, an instant tick that will make our heads flip and our hearts whole. So, here is a proposal for everyone, myself included, on how to slow down and attempt a streamlined life. 1. Break away from social media. Have a cut-off point in the evening to stop boredom-scrolling yourself into a panicked mess. Seeing what people have done with their days when you may or may not have been watching back-to-back episodes of "Breaking Bad" all day long while nursing multiple cups of tea is not a great motivator to end your day on. So, even though you may feel inclined to send future-proofing emails at 2 am, fuelled by faux social media pressure, it’s probably not the best idea. Get ideas out of your head and onto some paper, close the book and then leave it for the morning. Besides, writing is easier with coffee in hand. And, you don’t want anymore caffeine at 2 am. 2. Put your phone on silent. Leave calls or emails on loud if necessary, but let the constant chirp of WhatsApp subside, let Snapchat silence and let Twitter snooze in a nest of quiet for a while. When you’re trying to do something that requires your concentration, it's near impossible when you get stuck watching your phone as it shimmies closer to the edge of the table with every message vibration. Stop unnecessarily challenging your attention. Just make it simple. While it may be fun to set challenging resolutions for the year ahead, be realistic with time frames. It’s great to better yourself and carve new paths, but you can’t fill a bath with new skills and soak them all up like a sponge in one evening. (Although, someone should invent this. I would bulk order.) Things take time; don’t rush this and enjoy the time it takes to learn. 4. Try to stop comparing. I could squash this paragraph full of clichés, but I’m going to try something designed to be constructive. Accept moments for what they are -- good or bad, exciting or mundane. If you don’t like something, try to change it. Don’t worry yourself with other people’s achievements, or compare yourself to how far someone the same age or younger than you has come. Everyone falls; we just don’t run online to tell everyone about the day we cried until we were breathless, when we cared too much when we didn’t get the call or when we were crushed when we realized someone had moved on without us. We’re all human; we all feel the same. It’s just scheduled at different times for different people. And, in any case, you could be two days away from starting all over again -- and starting fresh is fun. It’s like getting a new textbook at school: It’s a bit scary, you feel pressured to use your best handwriting and keep everything neat in the beginning, but somewhere down the line, this ebbs away and things become more natural. Mistakes happen, so we cross them out and we try again. Life isn't a race; there is no agreed finish line or time in which to complete it. Slow down, enjoy small moments and try to stop comparing every small step you take to someone else's stride.